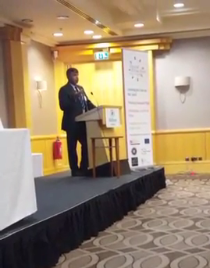 The Purpose of the event was to: Identify good practice to support victims of racial and religious hate crime and hate speech in Member States; build a strong partnership between the police and prosecution authority and minority ethnic community to support victims; identify issues and gaps at both national and EU level on the existing law, policy and practice; and showcase the progress of the Good Practice Plus project in different national contexts. The audience was addressed by the Minister of Justice of Northern Ireland Ms. Claire Sugden; Mr. Christian Ahlund Chair, the European Commission Against Racism and Intolerance (ECRI), Council of Europe; Ms. Linda Ravo legal and Policy Officer DG Justice, European Commission; Ms. Joanna Goody, Head of department Freedom and Justice, Fundamental Rights Agency and Mr. Ivan Ivanov, Executive Director of the ERIO. Speakers presented instruments for legal protections for victims of hate crime and hate speech, examples of hate crime recording and reporting system and the General Recommendation 15 of ECRI for combating hate speech. Mr. Ivanov spoke about Victim’s Right Directive and lessons learned from Roma community. He stressed that many Roma fall victims of hate crime every day, and the whole Roma population is subjected to hate speech by media, populist politicians and extreme right nationalistic groups in the society. “Every EU member state has specific provision in its Criminal Code forbidding racist offence and hate statements, but the reality shows that these provisions are not effectively applied” stated Mr. Ivanov. He added “The newly adopted Victims’ Rights Directive should be transposed by EU Member States in their domestic law in a way that make other hate crime and racism related legal provisions work”. Mr. Ivanov gave an example of hate crime referring to case of Nachova and Others v. Bulgaria, which was initiated by him and his colleagues in Bulgaria in mid 90s and ended up with a Grant-Chamber decision of the European Court of Human Rights in Strasbourg where the Court for first time in its history recognised violation of Art. 2 of the European Convention for Human Rights the right to life in conjunction to Art.14 the right to non-discrimination. The case concerns the murder of two Roma soldiers by a military officer." Participants also discussed issues concerning cybercrime, hate crime and extremism, good practices on police and public prosecutors. 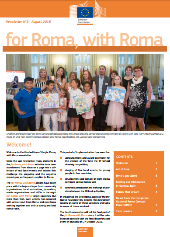 Since the last newsletter, many elements in the for Roma with Roma initiative have been transformed from ideas on a page into a col-lection of real local events and actions that challenge the prejudice and the negative stereo types so frequently applied to Roma. The for Roma, with Roma actions have taken place with the help and input from community organisations, local authorities, journalists, media organisations and NGOs in the eight for Roma, with Roma target countries. But more than that, each activity has occurred with active input from Roma and non-Roma working together and with a strong and loud Roma voice. Making a press statement in front of the Afyonkarahisar municipal building, Purçu said he was Roma and living a nomadic life was the case for most of these people. 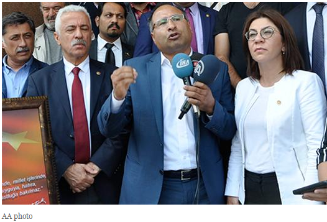 Saying that he called Afyonkarahisar Mayor Burhanettin Çoban to request services such as water, a playground and toilets for the Roma people who live in tents in the province, Purçu added his demand was first regarded positively but then was neglected. ​On 16 September 2016, the Office of the Czech Government Council for Romani Minority Affairs and the Secretariat of the Czech Government Council on National Minorities held a training on the principles of community work and development of the skills necessary for negotiating with local governments. The training was attended by Romani representatives who negotiate with the local authorities in the places where they work and also in the socially excluded localities in which they move. I was glad to be invited to the training because I am interested in the social situation of Romani people in other towns here. For many years I have been reading and translating into the Romani language, primarily for the the magazine Romano voďi, various conceptual documents about the integration of Romani people in the Czech Republic, from the Decade of Roma Inclusion, to the Coordinated Approach to Socially Excluded Localities, to the Support for Romani Integration, to the Support for Integration of Roma in the Schools, and many others. ​Roma teenager says she feels as though her last five years in Canada have been wasted and that she fears for her life, after the Immigration and Refugee Board decided that she and her mother must return to Hungary. A group of teenagers from Solihull have travelled to Bulgaria to support poor families from the Roma community. Young people, aged between 15 and 18, each raised £500 to travel to the Kyustendil region of Bulgaria. The group from Renewal Church taught workshops to local children and offered practical support. The trip was organised as part of ongoing work between the church in Lode Lane and churches in Bulgaria. The EU Slovak Presidency and the European Commission is organizing a High Level Event on Roma youth empowerment which will take place on October 10-11 in Bratislava. The event will bring together around 200 participants , representing relevant national authorities from the EU Member States, enlargement countries,international organizations, EU and national level NGOs, Roma and non-Roma youth and media. The conference will focus on promoting the role of Roma youth as a driving force in the Roma integration process. Official opening speeches will be delivered by Ms. Mrs Věra Jourová, Commissioner for Justice, Consumers and Gender Equality, European Commission , Mr Ján Richter, Minister of Labour, Social Affairs and Family of Slovakia and Mr Ábel Ravasz, Plenipotentiary of the Government of the Slovak republic for Roma Communities. ERIO representative will present the organizational experience in working with Roma youth and their role in advocacy for access to education and employment at national and local level.